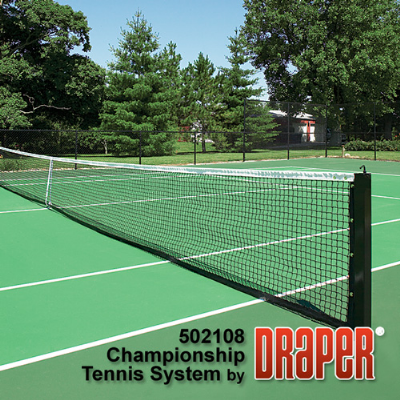 Draper offers the most durable, attractive and user-friendly tennis post available. These high-end 3" (8cm) square x 60" (152cm) posts include an internal net tensioner with ample cable take-up capacity and winding mechanism designed for heavy loads without fear of binding. Winding mechanism works with a 1/2" (13mm) socket. Posts finished with electrostatically applied black enamel and feature lacing rod. Heavy duty net (502100) is made with 3.0 mm hollow braid polyethylene twine, 36 oz. (1021g) single layer vinyl head band sewn with 4 rows of lock stitch. Bottom and side tapes are extra wide, abrasion resistant 18 oz. (510g) vinyl with brass grommets. All vinyl bands are treated with UV and mildew inhibitors. Net has 1/2" (127mm) fiberglass end dowels and 5/32" x 46’ (4mm x 1402cm) vinyl coated galvanized aircraft top cable. Tennis system is also provided standard with a polyester center strap (502111) and ground anchor (502112). Post can be used indoors or outside and can be direct buried or used with optional ground sleeve.